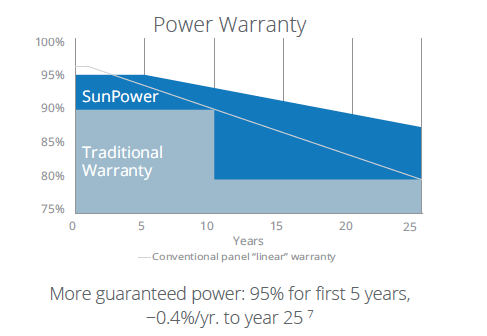 If you’re shopping around for solar, be sure to ask these important questions: What warranty terms are being offered? What is covered? Is the coverage for the product and the performance different? Panel manufacturers generally issue two guarantees. The first is a product warranty that covers the material from defect, paying for repair or replacement if the panel stops working as it should. Most panel manufacturers offer a product warranty ranging from 10 to 15 years. The second is a performance or power warranty. Solar panels slowly degrade over time, producing gradually less over the lifetime of the panel. Most panel manufacturers promise their product will still be producing at least 80% of its tested efficiency after 25 years. 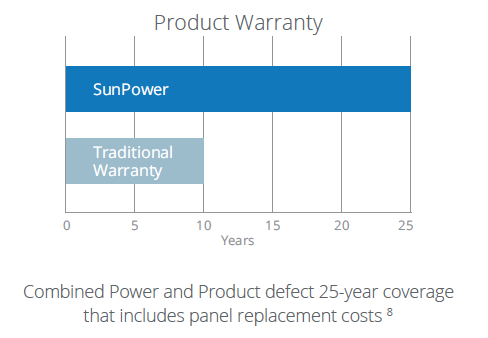 One of SunPower’s differences is their superior warranty that is unmatched on the market: 25 years for both their product and performance.